The title pretty much sums up thesis for this essay. 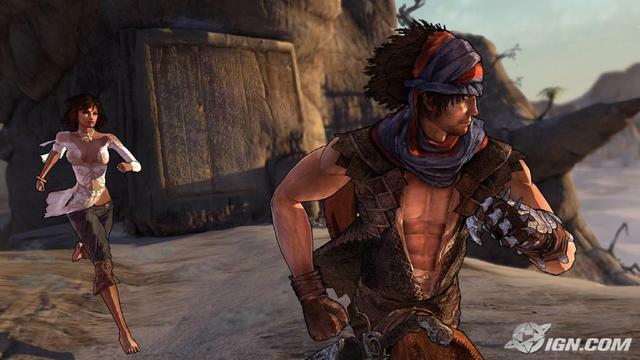 Prince of Persia has fallen to the trend of non-linear gameplay. It’s the new buzzword in the market. That’s all fine and dandy, and in the weeks up to its release even I praised the design as a merging of story and gameplay. However, now having played the game Prince of Persia has replaced Mirror’s Edge as my most disappointing game of 2008. It has nothing to do with the gameplay. It has to do with the story and more specifically with the story’s structure. My general issue with the story structure is that there really isn’t one. The designers constructed the beginning and the end and left the rest to the player. When it comes to telling an overall arc of a developing relationship, such a method is counterproductive to the story. The designer doesn’t know what order the evens are going to happen in the story. This means that the characters have to have a similar level of familiarly with each other throughout the game. The Prince and Eleka’s relationship doesn’t grow to the level that would make the ending functional or believable. Let me reiterate that, they do form a bond with each other, but they do not come to love each other. The game does not convince me of this. Actually their relationship with each other seems a little schizophrenic. After each boss fight in the lairs there seemed to be a moment or two of them growing closer, each highlighting some slightly different aspect of growth, but once you were back to the main areas, it was back to the old interactions. It was like they had actually reversed their character development. There also seem to be some questions about the relationship between the Prince and Eleka in general. The Prince follows the archetypical story of a rogue turned hero, through a period of reluctance before finally giving way to altruism. The thing about these changes in the Prince is that the alteration happens very early on. At first he follows her out of curiosity and self-preservation and then changes to wanting to save the world from the corrupting forces of Ahriman. This change happens right after the tree of life is destroyed and the entire world turns to darkness. The game has to, because if it didn’t and you gave the players free reign, then you have offered the choice of not saving the world. In a linear storytelling you could show forces beyond his control driving him forward, until he does so of his own free will. It offers a more dynamic characterization as well as an opportunity for his character to get closer to Eleka. Eleka seems perfectly in tap with this version of events as I got a distinct impression that she was spending her time trying to convince the Prince to help with lines like “Please, we must get moving” or “It used to be, before the corrupting influence of Ahriman.” But she is preaching to the choir. He is already committed to the task, so I’m a little confused with what she is trying to convince him of. The Prince and Eleka’s story is really that of Han Solo and Princess Leia of Star Wars fame. The Prince is not of nobility and is rogue looking for his big payout. Hans Solo looking for the money to pay of Jaba and the Princess his donkey packed with gold. Meanwhile, Eleka and Leia are both Princesses that are in danger, ironically by their father under the command of a greater malevolent evil, that are rescued by the rouge at first through self interest and then because he fell for her. This is basic story arc, but Prince of Persia fails to deliver the arc part. It offers a beginning and an end and leaves much of the middle to meander about. The meandering vignettes of each soul seller that has to be defeated offer a few highpoints to the storytelling. I find the antagonistic relationship between the Prince and the enemies far more interesting that I find the overall arc of the Prince and Eleka’s relationship. Each one is different and offers a different perspective of succumbing to Ahriman’s clutches. However among the few brilliant moments there is a lot of dross and repetition. Because you can do the areas in any order there can be no increase in antagonism or reference earlier incidents. In effect there is no rising action, which is really a point for the whole game. And without rising action there can be no effective climax. And now we come to the crux of the debate, the game’s ending. Mainly because the ending of the game invalidates what it has set up. An ending of a story must be the product of what the story has set up. Prince of Persia is a victim of hollywoodism relationships. Where the movies basically say ‘look a man and a woman as main characters they are together obviously’ and then in most cases does absolutely nothing to back this up. They are also working under the falsism of opposites attract. They do if there is some underlying similarity or jointly held interest. Saving the world from this one disaster is not a joint interest. The Prince would have pawned the task off on someone else if he could. It just so happens that there was no one else. Even so there wasn’t enough time to build up a meaningful relationship between the two characters. The ending wasn’t bad it just wasn’t justified. I had a few questions about certain details of the story. The first of which was, how much time do the Prince and Eleka spend together? It may seem unimportant, but a relationship takes time to build, especially one where the other is willing to sacrifice the world to bring back his love. There are no breaks in gameplay, Ubisoft makes sure we know this, the time you spend playing is in real time. There is no 1-day = 2 hours of Baldur’s Gate, no time spent unconscious a la Uncharted: Drakes Fortune, and no “one week later” title card of any random TV show. (Give me a break I can’t think of one.) Like in Aristotle’s ideal of storytelling, there is a unity of time. Of course everyone’s playtime will be different so for reference I looked for Ubisoft’s ideal time for completion. There is a trophy/achievement for completing the game in less than twelve hours. Twelve hours! Using this we learn that they spend less than half a day together and I’m expected to believe that they have fallen in love. It is enough time for me to believe that the Prince has grown friendly or attached to Eleka. Their banter makes me think that they’ve grown from general dismissal to mutual understanding and friendship. That’s all they’ve really had the time for. I may be reading too much into this, but then again even if you hammed the controls a few times and spent more time than twelve hours, the story couldn’t take place in much more time than that. On that note another trophy, entitled Precious Time, is received if you stand still for a minute after Eleka has died and is in your arms. This suggests that the Prince didn’t undo all of their efforts to re-imprison Ahriman in the heat of the moment or because of Ahriman whispering in his ear. He did it with deliberate forethought, weighed everything and made his choice. This is unreasonable for the way the character that was set up. There was no change in him that would make this believable. Finally, unlike what Michael Abbot has suggestion as another possible conclusion, there is an end, one that not only suggests a sequel, but blatantly tells you that it’s Too Be Continued. All of these problems and conflicting directions of the story come from its attempt to change the gameplay structure to that of a non-linear affair, but the story suffers for it. Because the player can go anywhere at any point the developers have to make the character interaction believable at every single point. There are two ways to do this, one is to have the story be dynamic and have their interaction change based upon what they’ve done and develop their relationship that way, or to have them say the same things in new pithy ways throughout the game and keep their relationship at a consistent level so it doesn’t matter what order they do the areas in. Ubisoft went for the latter. Then they pull out this ending where the Prince sacrifices the world for Eleka, which would have been fine had any sort of deep felt relationship been developed. Ubisoft tried to shoehorn a linear narrative into a non-linear game and paid the price for it. Honestly I didn’t really care about the ending, because I didn’t care for either of the characters or the threat they faced. I couldn’t bring myself to immerse myself in the experience and it was the first time in a Prince of Persia game that I found myself on the outside as I was playing. I fully recognized that I was controlling the Prince by remote control and it had nothing to do with the mechanics, but with the story. Some stories you place yourself and sympathies with the character, some you view at a distance, but within the world and others just make you realize that you are sitting in front of a screen holding a piece of circuited plastic. I didn’t hate these characters, worse I was ambivalent about them. The worst thing a creator can do is make their audience ambivalent about the work. At least if I hate them it means I find their own activities abhorrent to my own belief and I attach to them out of a sense of disgust in what they represent. Goodfellas would be an example of this. In conclusion, it is my firm belief that Prince of Persia would have played much better as a linear story with a linear progression and nothing at all would have been lost in the gameplay department. Not even going into that, the gameplay could have been improved and the game would have still retained the qualities aimed towards the less experience players that Ubisoft was going for. It is a real pity that the designers decided to succumb to trends without thinking about the consequences made their game “open world.” Were it linear they could have developed the relationship and increased the sense of closeness between the characters, despite time constrictions and then I along with others would have accepted the ending. It also would have fixed many other issues I had with the story that I did not get into here, but I think this is a major one that alone would have warranted the change. 6 Responses to "The Failure of Prince of Persia’s Story Structure"
I agree with you on one point, that the game didn’t need to be open world. Everything else however lies directly opposed to my views. Maybe I simply chose to defeat the bosses in the way Ubisoft Montreal intended but after each one my two portagonists crept noticably closer to each other, so much so that I even expected them to fall into each others arms at one point. These moments of intimacy are few and far between in the game. Why? They Pinrce and Eleka know they have a job to do, and it would be stupid to try and force them into a lengthy dialogue sequence mid-platforming section. Instead you’re given the option to talk to her briefly at the tap of a button. At the beginning of the game these conversations borderline on complete banality, the Prince asks about each area they enter, and Eleka tells him about the history of her land but by the end their bond becomes ever so apparent, when they catch their breath by playing a little I-spy. You’ve also completely failed to mentiona point which I believe is completely crucial to examining the relationship between the two protagonists. Eleka is their to save your life. If it weren’t for her the Prince wouldn’t have made it to the end of the first area in my experience, and certainly not to the end of the game where he FINALLY repays the favour. To save a life creates a near inescapable bond between two people, and by ignoring it you have invalidated a huge portion of your arguement. PS: You might want to try spell-checking your posts in future. Not this one, but the MGS4 article contained a couple of corkers. You bring up some counter arguemants and I appreciate them. The thing is about Eleka saving you through out the game, ignoring whether or not she loves you, ask the question ‘if you were falling to your death would she use her power to save you?’ The answer is yes. It is in her nature to be kind and alturistic. That is not my main reasson for ignoring it as a condition, however. My main reason, is that no matter how far you have progressed through the game or how much interaction the two characters have, she will always save you in the exact same manner. After a while it becomes more obvious as a game mechanic than it does an influence on their relationship. As there is no change in the manner of this interaction there is no effect on the overall story arc. I am looking at the story structure as a possible reason for the game’s failure to engage me with the characters and their relationship. Noting such a mecahnic could actually aid my argument, but it is a bit dicy of a subject so I left it out in favor of making my self more clear. P.S. Yeah that was more of a stream of conciousness post, but many were pointed out to me already and were corrected. If there were more I will double check.